Conor Kilpatrick returns to discuss everything we learned in parts 3 and 4 from the Eraserhead like beginning of part 3 to the most amazing Brando tribute yet. Donut disturb while listening! I can’t be the only one bothered that the chevron pattern on the black lodge floor is white and brown (not black and white). It was really obvious when the black object was sitting on the floor this episode. Looks to me more like a color correction issue. The old tiles were dark brown but that rarely tracked on TV. The scene with Albert and Gordon whispering outside the SD prison had a very obvious blue filter over the whole thing. I couldn’t help thinking it could be a nod to blue rose. Anyone else? Okay, Wally Brando is my new spirit animal. And I heard that a “blue rose case” is Cole’s parlance for an FBI case dealing with the supernatural. And when did Conor’s girlfriend become his wife? And I think Albert’s “I know where she drinks” is a reference to Sarah Palmer, who showed us in season 2 that she can commune with Black Lodge spirits, so Albert and Cole will want her powers to help them with spooky Mr. C.
Have you guys watched Lynch’s movies at all? 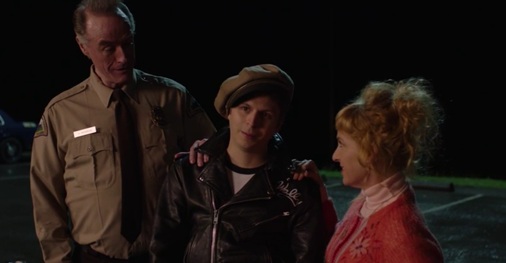 The early discussion was painful–Michael Cera’s Wally Brando is total Lynch, you just need to remember that he made an entire film (“Wild at Heart”) spoofing Marlon Brando, only with Nic Cage instead of Cera. I remember many interviews with Nick Cage talking about how he was channeling Elvis. I see the similarities you mention, but they seem more shared characteristics between Elvis and Brando. Tom, I’m a fan of the show, but I’ve taken a bit of an issue with the near fetishization of Mr. Frost. However, due to the fact that the world has taken on the fetishization of Mr. Lynch on (again) with such force, I know all my arguments will fall flat and ultimately be worthless. I do want to point out one glaringly​ incorrect observation brought up recently about the series so far-the cinematography. Peter Deming has been working with David Lynch since Lost Highway. He regularly works with David as well as Sam Rami and is known for fantastic and energetic camera movement (see the lense banging from Lost Highway or the Evil Dead POV shots from Evil Dead 2). Since working with David Lynch the two of them have been very complimentary with their styles (Mulholland Drive being the best example). Since the early 1990s, Lynch has been moving from the wide masters to the intimate medium shots and close-ups. The best example of this move was Fire Walk With Me, which seemed to be entirely shot in (sometimes extreme) close ups. Twin Peaks the Return seems to just be carrying on this style. I can’t tell you why David Lynch moved this way. His direction of wide shots are amazing (and they make a wonderful return in the Straight Story). Maybe he prefers the close ups because seeing people or things so close has the effect of warping reality. Maybe it’s just a cost issue (wide shots take much longer to light and choreograph) and David Lynch finds it easier to control what is in the frame better (he makes a lot of the props for his films such as tables, lamps, artwork etc). Maybe it’s both. One thing I have to say I really enjoy about the look and feel of the new Twin Peaks is the use of HAD video. Much like how he and Peter Deming played with the physicality of film in Lost Highway, Lynch is experimenting with the limits of HD video here. From the scan line heightened optical effect of spinning around the Black Lodge’s chevron tiles in the credits to vibrant colors that pop off the screen (the New York establishing shot) to the manipulation of time (purple room). That’s all I have. I love your podcast and hope to hear more. Great podcast! Did anyone notice that when Cooper-Dougy Jones was given his winnings the casino did not show him signing a statement of winnings. When anyone wins over six hundred at any casino, the law requires that they take you SSN & that you sign for it & they give you a check for the winnings. No casino would just give you a huge bag of cash! Reduculous.